I do not fully understand:does this mean that seedlings that you showed were from monoebryonic seeds with white cotyledons? I wanted so much to have seeds in the fruit. That's why I polished all of them. I did not care about nature. Unfortunately, no seeds. I wanted to see the seeds and wanted to plant them. Just like Sylvian did. In my opinion, this is the only way to get answers to some questions about the plant without the use of specialized workplaces and laboratories. Have you ever seen a real chimera for yourself? I do not think so. Do you know or even have some citrus chimeras from the former USSR? I've seen some of it in very old photos (50's or 60's). And it looked very convincing. E.g. orange, sometimes with trifoliate leaves. I saw some at noon. And it was always a plant without the other part - a pure orange. When cutting the screws, the second genome remained on the original plant. Is it even possible? If so, could it happen to the hybrid (Unshiu X P.T.) ITSZ Praha? If it's a chimera. > does this mean that seedlings that you showed were from monoembryonic seeds with white cotyledons? No, not at all. The seedlings I grow all come from one seed, the only one I had in many years. I Think the cotyledons were green but the main thing is that the seed looked like a "normal" citrus seed, like a lemon seed. The ones of this year are very different. They are big and puffy and we can see the green cotyledons through the testa. It makes bumps on the seeds making me think they are polyembryonic but I still didn't open one. They exactly look like yuko seeds that are very polyembryonic. The 'work' of these days is to eat the fruits and collect the seeds. Later I shall take pictures. > Hybrid (Unshiu x P. ITSZ Prague“ is the greatest mystery among citruses for me. It will remain like this as long as you shall consider Prague chimera like a(n) Hybrid. When you will think of a chimera, everything will become clear and even evident. > I've seen some of it in very old photos (50's or 60's). And it looked very convincing. E.g. orange, sometimes with trifoliate leaves. If you know an equivalent chimera with orange please immediately take cuttings ( and send me some ;-) ). > When cutting the screws, the second genome remained on the original plant. Is it even possible? If so, could it happen to the hybrid (Unshiu X P.T.) ITSZ Praha? If it's a chimera. I am not sure to understand this sentence but if you mean "is it possible to obtain a pure mandarine fruit from a(n) hybrid of poncirus", the answer is absolutely 'NO' for an hybrid and absolutely 'YES' for a chimera! It is the same for a pure trifoliate branch, the answer is absolutely 'NO' for an hybrid and absolutely 'YES' for a chimera! It is the same for monofoliate polyembryonic seedlings and for everything we can see on the prague. It is always NO for a hybrid and always YES for a chimera. When do Prague fruit ripen? Before freezing weather? This year I picked them the first days of the new year but many people would feel them overripe, very sweet with low acidity. For me Christmas / New Year. It is still outdoors, but protected by the sail. "It was from Petr Broza. At this time (2008/2009) we were only three (with B. Voss who found it) to have it." I had it aswell. 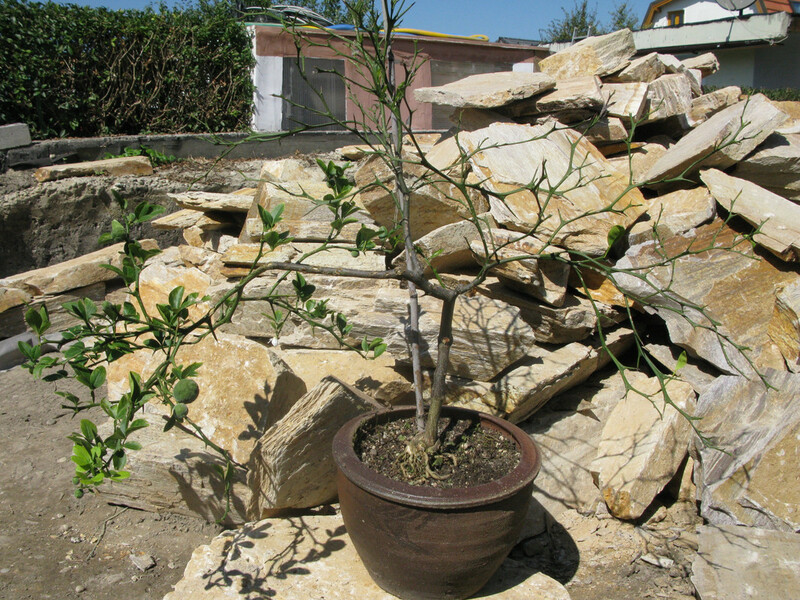 Mine grows in open soil grafted on 1m Poncirus in my Viennese Garden. I reported about the "strange thing" in the US-forum which is now down. The motherplant shown there is still potted. The chimera is hardy at least down to -15°C. Sylvain, may I borrow the pics from you? I have a presentation about "strange things about citrus" in a few weeks. I'm glad to meet you all again. Indeed you can use any of my pictures. I look for yours but as they were on postimg.com, they are lost. This is the right picture. The best I have. You can see two Poncirus-Fruits on it, but it is "Prague" By the way I have cut away the offspring and grafted it on a PT-seedling. It flowers but always throws away its fruits. But they are PT -no hope of anything else. Very nice! Mines are at the same state. Did you notice that the new growths go straight to the sky? your plant went out of the "bushy state". Snek, your Prague has kept ists leaves. Very interesting. Mine gets rid of them in autumn. It will come to me the same as other years. First up, but quickly turn down. It will be seen later. Rather I think not ( The image can not be pasted now, I will try later). I'll watch. But stigma is not sticky. Or just little. Part of the leaves will always remain over the winter. Here's hoping mine will make fully functional flowers this year. It is not yet flowering but there are a few buds. Even fully functional flowers do not mean they will be fruit. Well, at least there are stigmas in some flowers now. That's a progress..
Florian, as they say...."Good things come to those who wait". Sylvain reported such a variegation some time ago, but strangely enough I never have seen it with my Prague. after hard frost the leaves of my plant show some kind of "variegation": dead and living parts. The satsuma tissue is killed earlier than the Pt-tissue in the leave, I suppose.